This event's performance date has changed (the old date was Monday, 11 Mar 2019 at 7:00 PM). The show will now take place on Thursday, 22 Aug 2019 at 7:00 PM. 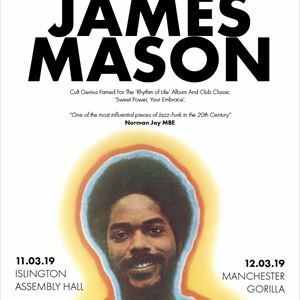 AGMP are delighted to be welcoming back James Mason for the first time in 15 years to perform two worldwide exclusive concerts in 2019. James Mason is a keyboardist / guitarist who was a part of the Roy Ayers band in the late 1970's. His only solo album "Rhythm of Life" was released in 1977 on the Chiaroscuro Records label which has become a holy-grail on the vinyl collectors market. The album featured Narada Michael Walden, Justo Almario, Mbewe Ninoska Escobar, Gene Torres and the heavenly vocals of Clarice Taylor, amongst others. The lead track from the album "Sweet Power, Your Embrace" was a massive club tune in the 1980's Rare Groove scene and the 1990's Acid Jazz scene. In 1996, AGMP presented the first ever James Mason concerts anywhere in the world for three sold out shows in London. An unreleased single recorded just after his debut album "I Want Your Love" b/w "Night Gruv" was issued to co-incide.